At first the squirrel spins his cage; then the cage spins him. Men of business may take warning. As quoted on imdb.com bigraphy page for Bruce Dickinson. Geoffrey Keynes and Brian Hill (eds. ), Samuel Butler’s Notebooks (1951), 144. But the idea of science and systematic knowledge is wanting to our whole instruction alike, and not only to that of our business class ... In nothing do England and the Continent at the present moment more strikingly differ than in the prominence which is now given to the idea of science there, and the neglect in which this idea still lies here; a neglect so great that we hardly even know the use of the word science in its strict sense, and only employ it in a secondary and incorrect sense. Schools and Universities on the Continent (1868),278-9. Each volcano is an independent machine—nay, each vent and monticule is for the time being engaged in its own peculiar business, cooking as it were its special dish, which in due time is to be separately served. We have instances of vents within hailing distance of each other pouring out totally different kinds of lava, neither sympathizing with the other in any discernible manner nor influencing other in any appreciable degree. In Report on the Geology of the High Plateaus of Utah (1880), 115. Engineering, medicine, business, architecture and painting are concerned not with the necessary but with the contingent—not with how things are but with how they might be—in short, with design. In The Sciences of the Artificial (1996), xii. His [Edison’s] greatest invention was that of the industrial research laboratory, turning out inventions as a business. In The Human Use of Human Beings: Cybernetics and Society (1950), 127. If Thomas Edison had gone to business school, we would all be reading by larger candles. What They Don't Teach You at Harvard Business School (1984). 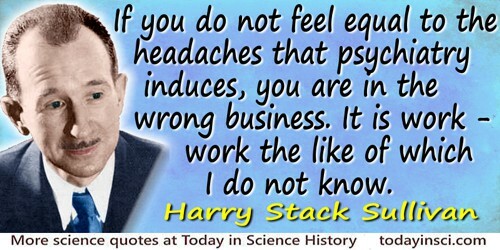 If you do not feel equal to the headaches that psychiatry induces, you are in the wrong business. It is work - work the like of which I do not know. Is it not evident, in these last hundred years (when the Study of Philosophy has been the business of all the Virtuosi in Christendome) that almost a new Nature has been revealed to us? that more errours of the School have been detected, more useful Experiments in Philosophy have been made, more Noble Secrets in Opticks, Medicine, Anatomy, Astronomy, discover'd, than in all those credulous and doting Ages from Aristotle to us? So true it is that nothing spreads more fast than Science, when rightly and generally cultivated. Science and the Modern World: Lowell Lectures, 1925 (1925), 291. I’m afraid for all those who’ll have the bread snatched from their mouths by these machines. … What business has science and capitalism got, bringing ail these new inventions into the works, before society has produced a generation educated up to using them! Dialog for Aune, in the play The Pillars of Society, Act 2. Collected in Henrik Ibsen and James Walter McFarlane (ed. ), Ibsen: Pillars of society. A Doll’s House. Ghosts (1960), Vol. 5, 52. 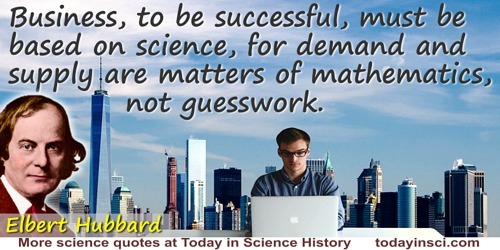 No scientist is admired for failing in the attempt to solve problems that lie beyond his competence. … Good scientists study the most important problems they think they can solve. It is, after all, their professional business to solve problems, not merely to grapple with them. The Art of the Soluble: Creativity and Originality in Science (1967), 7. Now, the causes being four, it is the business of the student of nature to know about them all, and if he refers his problems back to all of them, he will assign the “why” in the way proper to his science—the matter, the form, the mover, that for the sake of which. Physics, 198a, 22-4. In Jonathan Barnes (ed. ), The Complete Works of Aristotle (1984), Vol. I, 338. 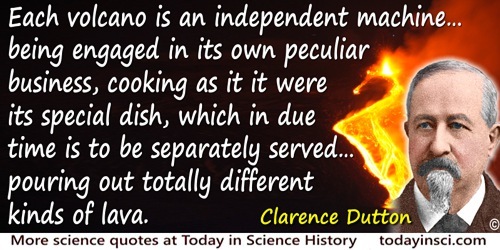 People without independence have no business to meddle with science. It should never be linked with lucre. In George Wilson and Archibald Geikie, Memoir of Edward Forbes F.R.S. (1861), 392. Remember the Three Princes of Serendip who went out looking for treasure? They didn't find what they were looking for, but they kept finding things just as valuable. That's serendipity, and our business [drugs] is full of it. Research has been called good business, a necessity, a gamble, a game. It is none of these—it’s a state of mind. Science is really in the business of disproving current models or changing them to conform to new information. In essence, we are constantly proving our latest ideas wrong. Success is being able to make an impact in what matters most to you. When this type of engine was given another chance it was an immediate success [because now] an accuracy of a quarter of a tenth of a thousandth of an inch [prevents high-pressure oil leaks]. … If we had taken the results of past experience without questioning the reason for the first failure, we would never have had the present light-weight, high-speed Diesel engine which appears to be the spark that will revitalize the railroad business. 'Industrial Prospecting', an address to the Founder Societies of Engineers (20 May 1935). In National Research Council, Reprint and Circular Series of the National Research Council (1933), No. 107, 2-3. The business of concrete mathematics is to discover the equations which express the mathematical laws of the phenomenon under consideration; and these equations are the starting-point of the calculus, which must obtain from them certain quantities by means of others. In Positive Philosophy, Bk. 1, chap. 2. The business of their weekly Meetings shall be, To order, take account, consider, and discourse of Philosophical Experiments, and Observations: to read, hear, and discourse upon Letters, Reports, and other Papers containing Philosophical matters, as also to view, and discourse upon the productions and rarities of Nature, and Art: and to consider what to deduce from them, or how they may be improv'd for use, or discovery. 'An Abstract of the Statutes of the Royal Society', in Thomas Sprat, History of the Royal Society (1667), 145. The contents of this section will furnish a very striking illustration of the truth of a remark, which I have more than once made in my philosophical writings, and which can hardly be too often repeated, as it tends greatly to encourage philosophical investigations viz. That more is owing to what we call chance, that is, philosophically speaking, to the observation of events arising from unknown causes, than to any proper design, or pre-conceived theory in this business. This does not appear in the works of those who write synthetically upon these subjects; but would, I doubt not, appear very strikingly in those who are the most celebrated for their philosophical acumen, did they write analytically and ingenuously. 'On Dephlogisticated Air, and the Constitution of the Atmosphere', in The Discovery of Oxygen, Part I, Experiments by Joseph Priestley 1775 (Alembic Club Reprint, 1894), 5. The Earth has no business possessing such a Moon. It is too huge—over a quarter Earth’s diameter and about 1/81 of its mass. No other planet in the Solar System has even nearly so large a satellite. In Asimov on Physics (1976), 46. 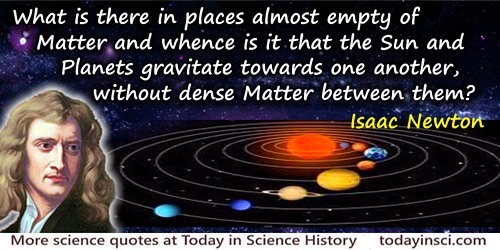 Also in Isaac Asimov’s Book of Science and Nature Quotations (1988), 166. The first business of a man of science is to proclaim the truth as he finds it, and let the world adjust itself as best it can to the new knowledge. Letter to R. M. Hunter, 23 October 1919. In Maila L. Walter, Science and Cultural Crisis: An Intellectual Biography of Percy Williams Bridgman (1990), 32. The first business of a teacher … should be to excite … curiosity. … This process saves a student from being (as many are) intellectually damaged by having a very good memory. The key to success for Sony, and to everything in business, science and technology for that matter, is never to follow the others. Founder of Sony, quoted in Fortune (24 Feb 1992). In Julia Vitullo-Martin and J. Robert Moskin, The Executive's Book of Quotations (2002), 271. The universe is reeking with organic matter. You could say that the universe is in the business of making life—or that God is an organic chemist. From interview, 'The Seeds of Life', in The Omni Interviews (1984), 10. This minding of other people’s business expresses itself in gossip, snooping and meddling, and also in feverish interest in communal, national and racial affairs. In running away from ourselves we either fall on our neighbor’s shoulder or fly at his throat. We now live in an age in which science is a court from which there is no appeal. And this issue this time around, at the beginning of the twenty-first century, is not the evolution of the species, which can seem a remote business, but the nature of our own precious inner selves. Were it my business to understand physic, would not the safe way be to consult nature herself in the history of diseases and their cures, than espouse the principles of the dogmatists, methodists, or chemists? In Essay Concerning Human Understanding (1796, 20th ed. ), Vol. 2, Book 4, 383. When I quitted business and took to science as a career, I thought I had left behind me all the petty meannesses and small jealousies which hinder man in his moral progress; but I found myself raised into another sphere, only to find poor human nature just the same everywhere—subject to the same weaknesses and the same self-seeking, however exalted the intellect. As quoted “as well as I can recollect” by Mrs. Cornelia Crosse, wife of the scientist Andrew Crosse. She was with him during a visit by Andrew to see his friend Faraday at the Royal Institution, and she had some conversation with him. This was Faraday’s reply to her comment that he must be happy to have elevated himself (presumably, from his apprenticeship as a bookbinder) above all the “meaner aspects and lower aims of common life.” As stated in John Hall Gladstone, Michael Faraday (1872), 117. While we keep an open mind on this question of vitalism, or while we lean, as so many of us now do, or even cling with a great yearning, to the belief that something other than the physical forces animates the dust of which we are made, it is rather the business of the philosopher than of the biologist, or of the biologist only when he has served his humble and severe apprenticeship to philosophy, to deal with the ultimate problem. It is the plain bounden duty of the biologist to pursue his course unprejudiced by vitalistic hypotheses, along the road of observation and experiment, according to the accepted discipline of the natural and physical sciences. … It is an elementary scientific duty, it is a rule that Kant himself laid down, that we should explain, just as far as we possibly can, all that is capable of such explanation, in the light of the properties of matter and of the forms of energy with which we are already acquainted. From Presidential Address to Zoological Section of the British Association for the Advancement of Science. As quoted in H.V. Neal, 'The Basis of Individuality in Organisms: A Defense of Vitalism', Science (21 Jul 1916), 44 N.S., No. 1125, 82. [Florence Nightingale] was a great administrator, and to reach excellence here is impossible without being an ardent student of statistics. Florence Nightingale has been rightly termed the “Passionate Statistician.” Her statistics were more than a study, they were indeed her religion. For her, Quetelet was the hero as scientist, and the presentation copy of his Physique Sociale is annotated by her on every page. Florence Nightingale believed—and in all the actions of her life acted upon that belief—that the administrator could only be successful if he were guided by statistical knowledge. The legislator—to say nothing of the politician—too often failed for want of this knowledge. Nay, she went further: she held that the universe—including human communities—was evolving in accordance with a divine plan; that it was man's business to endeavour to understand this plan and guide his actions in sympathy with it. But to understand God's thoughts, she held we must study statistics, for these are the measure of his purpose. Thus the study of statistics was for her a religious duty. In Karl Pearson, The Life, Letters and Labours of Francis Galton (1924), Vol. 2, 414-5. [In relation to business:] Invention must be its keynote—a steady progression from one thing to another. As each in turn approaches a saturated market, something new must be produced. [Regarding evolution believers:] Their business is not with the possible, but the actual—not with a world which might be, but with a world that is. This they explore with a courage not unmixed with reverence, and according to methods which, like the quality of a tree, are tested by their fruits. They have but one desire—to know the truth. They have but one fear—to believe a lie. 'Scientific Use of the Imagination', Discourse Delivered Before the British Association at Liverpool, (16 Sep 1870). 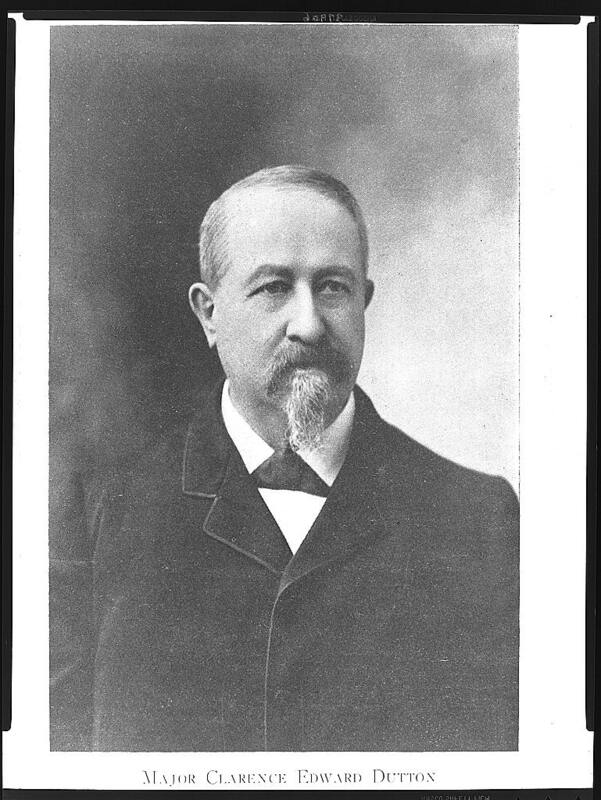 Fragments of Science for Unscientific People: A Series of Detached Essays, Lectures, and Reviews (1892), Vol. 2, 134. [The best motivator for employees is] progress. [The biggest myth in business is that] bigger is better. A business should be judged not by its size but its impact.